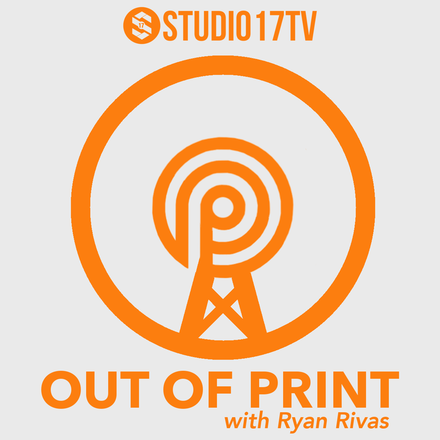 Out of Print is a podcast featuring conversations with Orlando and Florida writers about a specific piece of their work (and sometimes others’). It’s like an audiobook, only shorter… and with director’s commentary, sort of. Tune in to discover contemporary books, poems, essays, short stories, and your new favorite writers. Get to know your host Ryan Rivas. Amy Watkins talks mythology, her fear of birds, and discovering Florida as a landscape worthy of literature. Work read & discussed: "Knowing My Place" (essay); "Crossing the River" (poem). Brianna Johnson talks Bad Brains, punk rock, race and indentity. Work read & discussed: "I Against I" (short fiction). ABOUT THE AUTHOR: Brianna Johnson is an emerging writer from Orlando, FL. She received her MFA from The University of Tampa, and currently works as an adjunct professor of English at Seminole State College & Valencia College. Along with teaching, she is the managing editor of Burrow Press's online literary journal, Fantastic Floridas. Her short story, “I Against I” was recently published in Cosmonauts Avenue. Lucianna Chixaro Ramos talks experimental writing, chance operations, challenging poetic forms, and bees. Work read & discussed: excerpts from "Cell" (poetry collection). ABOUT THE AUTHOR: Lucianna Chixaro Ramos is a Brazilian-American poet. She is the Editor in Chief of Obra/Artifact, a journal of experimental literature, and an MFA student at Stetson University's MFA of the Americas. Her work can be found in the journals New South and Otoliths. Racquel Henry talks about her love/hate relationship with Orlando, discovery in the writing process, her novel in progress, and Young Adult fiction. Works read & discussed: "When To Stay" (essay). ABOUT THE AUTHOR: Racquel Henry is a Trinidadian writer and editor with an MFA from Fairleigh Dickinson University. She is also a part-time English Professor and owns the writing center, Writer’s Atelier, in Winter Park, FL. In 2010 Racquel co-founded Black Fox Literary Magazine, where she still serves as an editor. She is also a board member for The Jack Kerouac Project, an Orlando-based writing residency. Her fiction, poetry, and nonfiction have appeared in places like Lotus-Eater Magazine, Moko Caribbean Arts & Letters, Thrill of the Hunt: Welcome to Whitebridge, Reaching Beyond the Saguaros: A Collaborative Prosimetric Travelogue (from Serving House Books, 2017), and We Can't Help It If We're From Florida (from Burrow Press, 2017), among others. Talk about the portrayal of Oviedo in the book The New World, and the good/bad writing about Florida places.